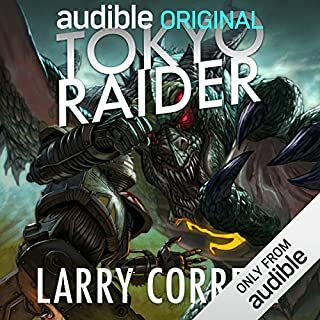 In this brand-new Grimnoir Chronicles story written exclusively for Audible, it's 1937 - four years after the Grimnoir Society defeated the magical alien force known as The Power. "Heavy" Jake Sullivan is summoned by his oddest ally, Dr. Wells, to stop the bombing of a new ultra-luxury airship. Amid the glitz, the gambling, and the high-society types, Sullivan races time to hunt for the saboteur. But surrounded by a blimp-full of Germans, Russians, Imperium Iron Guard, and other magical enemies - where can he even begin? 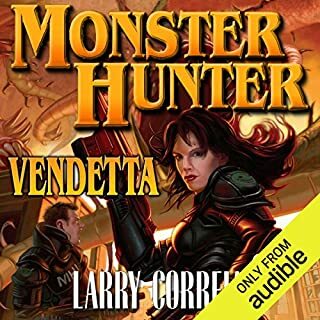 Larry Correia has already made a name for himself in the sci-fi/fantasy world with his Monster Hunter books, but now he's written the first in new series that takes place in New York in the 1930s, filled with dubious federal agents, hardboiled detectives, and dames with a whole lotta chutzpah. Except this isn't quite the New York you might expect, but an alternate universe where zeppelins moor at the top of the Empire State Building, the Titanic never sank, and mad scientist Nikola Tesla has created a devastating weapon called the Geo-Tel. Oh, and people have magical powers. They are known as Actives. It's become commonplace for some people to defy gravity, teleport, manipulate animals, and heal by touch. The hero here is Jake Sullivan, a detective and ex-con who is set free by the FBI to track criminal Actives, which J. Edgar Hoover (yeah, he's still around) would like to eradicate. Actor Bronson Pinchot has become a regular go-to for audiobooks and the reason is obvious - the guy knows how to bring a story to life. Far from his manic days as Balki on Perfect Strangers, Pinchot is a warm, imminently listenable narrator. He's obviously having a ball with Hard Magic, gruffing up his voice for the hardboiled Jake and the various G-men and employing a countrified voice for Faye, a young farm girl who can teleport across great distances and becomes vital to saving the world from destruction by the Geo-Tel. Pinchot gives each character a different voice, so it's easy to keep up with the big cast. Correia writes long, colorful descriptions of his characters and their situations, but those passages never become boring and never get in the way of the action, thanks to Pinchot. 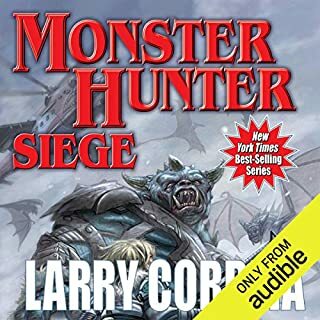 ©2011 Larry Correia (P)2011 Audible, Inc. This book is one of my favourites, ever. The narration by Pinchot is truly engaging, giving life to each character as though it were a full-cast audio drama. The pacing, the style, and the content all blend into a seamless story that keeps you holding on. I honestly think that this book is complete, that it could stand alone; that it is just the first in the series is a real bonus. There's a fine balance between true history, and the 'what-ifs' of a world that has had magic thrust upon it. Sure, there's the fun side of it all, but then there's the truly horrific side of it---the reality of zombies, the Great War with wizards, and the real human psyches that have to deal with all of it. The characters are all engaging, but Fay(sp?) is a sparkling wonder. Her development is beautiful, and hilarious. Listen to the first chapter, and you'll be hooked. After reading the summary I thought it was going to be a detective type novel and even the first few hours of the book made it seem like it was going to take that path but as the story unfolds it becomes so much more. 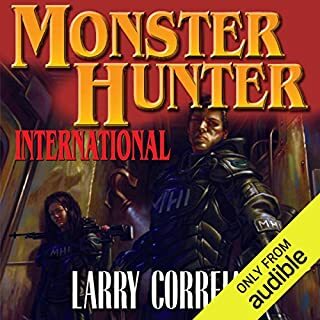 Unlike his other story (Monster Hunters International) this one is more focused on magic and goes into more detail on how the magic system works. 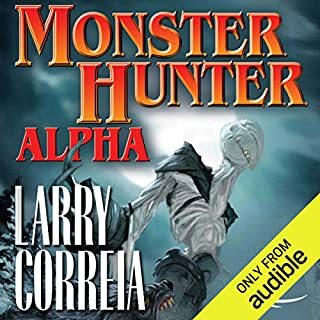 In the end I ended up liking it a lot more then I did Monster Hunters International and I purchased all 3 books from that series. The preview made me hesitate to purchase the book because I didn't like the narrator at first due to most of the characters sounding like dim witted oafs but I decided to take a chance and purchased it. I was gladly mistaken about the narrator and as the story went on and introduced more characters Bronson really began to shine. He gives each character a unique and easily recognizable voice except for a lot of the hired muscle that you run into at the beginning of the story. So if you are still on the fence about purchasing this book due to the narration in the preview give it a chance and you should be happily surprised. 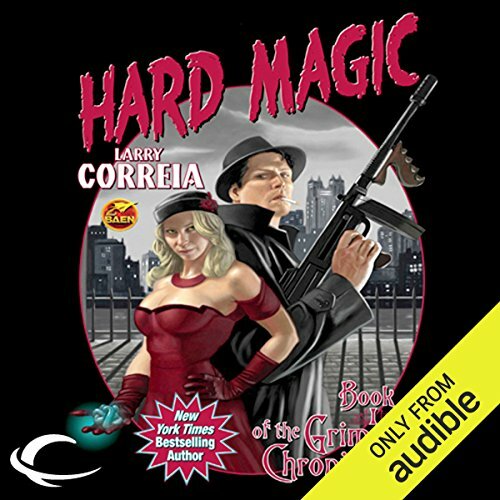 If you like intricate and well-planned magic systems, brilliant plots, exciting pacing, well-developed characters, and a perfect dose of stuff blowing up, Larry Correia's Hard Magic is for you. I love this story. It is mentally and emotionally completely satisfying, yet maintains a quick, light feel. It's fun to listen to. And even better: it's narrated by Bronson Pinchot, who is, without doubt, the best narrator I've encountered thus far. He does all the voices, not just distinctly, but vividly. The life that he breathes into each and every one is, well, just plain delicious. It's so good that I'm buying every book in this series both in hardback and as an audiobook--as long as Pinchot continues as narrator! 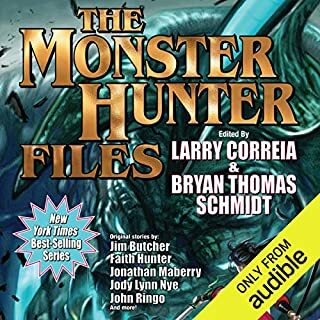 I was worried (based on the description) that this would just be a weak dresden files knock off, but after listening to the Monster Hunter books I decided to give this book a shot. It's nothing like the description says, and much bigger and better than it sounds. WWI was fought, in part, with magic. Hydrogen powered dirigibles dominate the skies because wielders of fire can prevent Hindenburg-like incidents. Genius supplemented with magic creates supergeniuses (Cogs) that advance technology far beyond what was imaginable. Nikola Tesla provides an (extremely deadly) alternative to nuclear weapons... and I'm not even giving away the story! This book is packed full of ideas and historical figures and characters that bring to life a parallel universe that you'll be convinced must exist. Every chapter begins with an in-universe quote, often from a real-life political or scientific heavyweight of the time, that provides a peak inside the heads of those native to the that universe, allowing us to understand how living in a world where magic exists might actually impact society, ethics, and science. Bronson Pinchot absolutely dominates as narrator. His accents, articulation, tone, and pacing are so perfect for all of the major characters, and there are many. James Marsters of the Dresden Files has become my favorite narrator due to his ability to perfectly become the voice of whatever character he's reading for, but in this book Pinchot provides a depth of character that is unsurpassed. There are quite a few difficult characters to read for in this book, and Pinchot shines through all of them. He absolutely gets the subtle and well-deserved haughtiness of Japanese soldiers and officers, enhanced with magic, who are arguably the deadliest the world has ever known. Hard Magic has historical fiction, urban fantasy, and science fiction absolutely covered. If you like the Dresden Files or other urban fantasy-type novels, you will definitely enjoy this book and the sequel. There are strong, capable female and male protagonists alike. 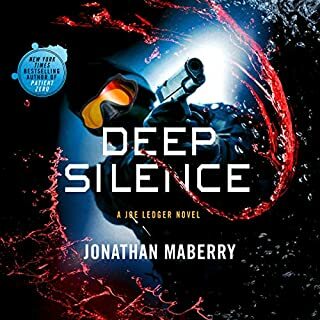 I will say that a few moments felt a lot like some superhero movies I've seen, and around the half point of the book, I felt like I was listening to a story based on the X-men Universe. But, don't fret. While perhaps inspiration and genre sampling from such sources may impact this story, it really is so much more than simple power flinging and devastation. Though, there is quite a bit of that. Even after the sequel, I still want more. I can't wait for the 3rd book, and I really really hope that they're able to get Bronson Pinchot for the part. 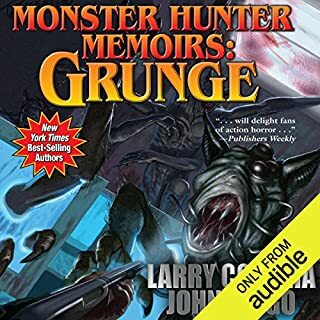 I loved the monster hunter books, so I figured this had to be good. It surpassed the monster hunter series for me. The characters are more developed, there is less time wasted on elaborate descriptions of firearms, and there's a whole lot of action. I can't wait to see what the next one has to offer! I'm a big fan of Butcher's The Dresden Files, which mixes the noir detective genre with contemporary magic/urban fantasy. I was looking for something similar when I came across Correia's Grimnoir series. My first impression of this book from looking at the cover and from the first chapter or so was that it looked like a really hammy alternative fiction with superpowers, but as I listened it opened up into an exciting, imaginative, highly-engaging adventure. In Correia's world, magical powers manifest themselves within individuals as superpowers around 1860, and Correia opens his chapters with fictionalized excerpts from famous people from Lincoln to Roosevelt to Woodrow Wilson as they comment on the influence of these powers on history. Each of these powers have specific uses and limitations that made me think of magic in Sanderson's Mistborn saga in that they are well defined and have their limitations, which allows Correia to show how the characters are being clever with their abilities. The book follows two central characters in the early 1930s. Faye is an "Okie," part of a poor family from Oklahoma who was traveling west in the hopes of finding work and food. Her family ostracized her for being different, for having the power to "travel" in the blink of an eye, and sold her for $10 to a Portuguese farmer with a similar talent. Her new "grandfather," Joe, taught her how to harness her ability and taught her the value of hard work, but when his past catches up to him she finds herself on the road looking for revenge. Sullivan was a WWI hero and now is an ex-con working off his parole by helping J. Edgar Hoover and the new FBI track down dangerous "Actives" (people with powers). Sullivan may look like a big, brutish idiot, but he's sharper than he looks, and it's that intelligence that helped him discover the depth and breadth of his gravity-altering abilities while quarrying rock in the government's special prison for Actives. Faye and Sullivan become unwillingly embroiled in a conspiracy involving the battle between the menacing Japanese Imperium and a secret society of Actives all clamoring for a mysterious device of immense power. The plot was very well paced with plenty of action AND character development. 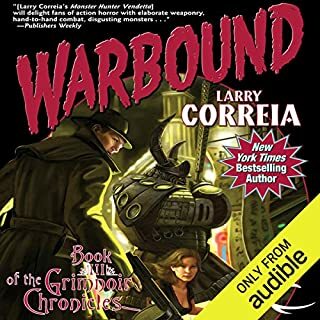 The story is told form a third-person limited point of view but Correia added enough voice to the prose and Pinchot's narration added enough flavor to keep Faye's and Sullivan's sections distinct and interesting, reflecting the inferiority of each character. Correia might have expanded on how individual magical superpowers are linked (or not) to the kind of magic in spells and writing a bit earlier as early on in the book I was wondering why we are calling it "magic" and why we wouldn't just treat it like superpowers a la X-Men. It was developed later on, but if you find yourself wondering the same thing, just wait a while and it'll be dealt with. I enjoyed the inventiveness applied in the alternate history of the late 19th, early 20th century as it didn't throw things too out of whack and played with the historical tensions that were already there including the growing concern of Japanese imperialism and the general relaxing of tension in America following World War I. I did, however, feel that the characterization Japanese was flat overall. While the only Japanese we see are soldiers of the Imperium and their terrifyingly powerful Chairman Tokugawa, as a people they did feel very "Othered" in this story: they come across as just part of a big, bad, conquering war machine and not much else. While this may be how they would have been seen by contemporary Americans since there was not a lot of cross-cultural understanding between those two cultures at the time, still it irked me a bit. Overall, however, the characters feel vibrant and interesting, even the Japanese Chairman. 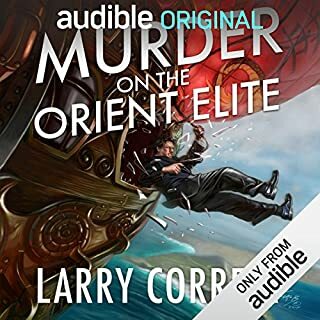 I very much enjoyed this audiobook as it was a fun ride with inventive use of magic, thrilling action and adventure, and very affective characters. 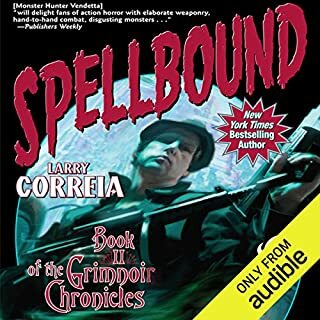 The book sets up the challenges and mysteries awaiting the characters in future installments well and left me hungry for more, so I look forward to downloading Spellbound soon. Pinchot's narration was very engaging and he has a good range for different voices. 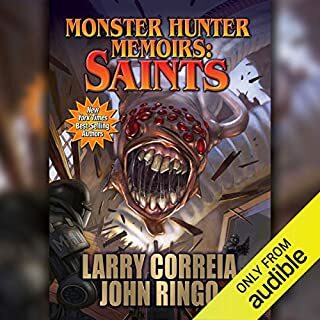 I would describe his narration as somewhere between James Marsters and Scott Brick (but maybe a Scott Brick who spoke in a quicker, more animated fashion). Yes, it's as good as they say. Thoroughly enjoyable and complete engaging. Correia's pacing is perfect, not breakneck but never sagging. His plotting is sufficiently complex to keep surprising you but it never becomes ponderous convoluted or overloaded with back story. I am more than a little zombie averse, and I am a pretty hard sell for modern urban fantasy so it took a lot of convincing raves from excellent reviewers for me to take a chance on this one. I'm very glad I did. 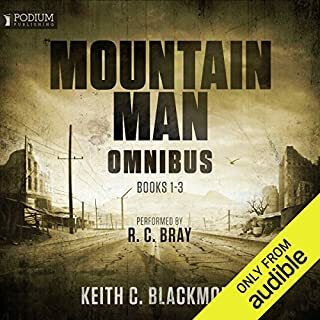 This is a fantasy genre writer at the top of his game read by a superb narrator who never missed an inflection, mangled a pronunciation or botched a meaning with a misread sentence. It is rare that genre writing breaks through and transcends its genre to become deeply satisfying literature (Ray Bradbury, would be a prime example). That does not happen here, so four and a half stars, but I had such a great time listening to Hard Magic, that I feel a little miserly withholding that final half star. So unless you are unalterably opposed to very high quality cheap thrills, this is a ride you might want to get on. I sure can't wait for book 2. Characters are well defined and it's very easy to love the good guys. It all starts as a noir novel that takes place in an alternative history where Magic exists but rapidly the noir side of the novel subsides to make place for a thrilling and suspensful magical, adventure story with emblematic characters. I grew to like the way the book was narrated. Characters' voice is well-defined which makes the identification of each of them very easy. Unlike a previous reviewer, I love the quotes at the begining of each chapter. They are, of course, all invented and through them you can understand how diferent his world is from ours (Hitler was executed in 1929 in Munich for example). An awesome book, very highly recommended. I picked this up on a 4.95 sale, and was happily surprised. It's a unique hard boiled alternate history 1920's crime fiction. Bootlegging, bank robbery, Model T's, the Great Depression, Okies, Portuguese pride, helium derigibles. 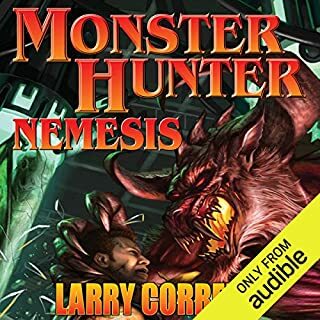 Larry Correia really covers his bases. It's like getting a window into the past, with magic. Famous quotes by Einstein, Tesla, Hoover, and many other notables are altered to make them appear to be Actives. The main character is an Active which reminds me of Marv from Frank Miller's Sin City, or Shadow from Neil Gaiman's American Gods. I would gladly have paid the regular price to hear this book. Bronson Pinchot has a very VERY masterful range of character voices. I mean this is a guy that can convincingly manage an Okie country drawl, and an aged Portuguese rancher, and make it sound easy. The only thing I could possibly dislike, is that his version of a certain slow speaking character is so convincingly hypnotic I have trouble staying awake, and catch myself holding my breath for the next word. He was probably intending that response. It's like listening to my history teacher on a warm day. First, ignore the hideous cover, which is one of the few downsides to the audiobook. Second, you should note that by the end of the novel there are epic fights which seamlessly includes sky pirates, magic ninjas, and zombies along with death rays, sword fights, and wizards - all without invoking a single cliche or seeming at all corny. If that works for you, you should get this book. 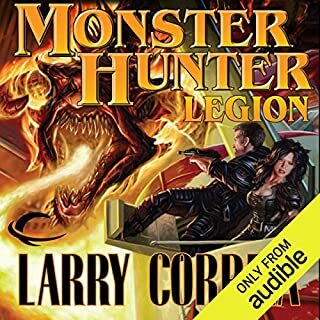 Larry Correia knows how to write action scenes, and Bronson Pinchot knows how to read them, making this one of the more cinematic (in a summer-blockbuster-sort-of-way) audiobooks I have listened to. The setting is also better than expected, going beyond the expected magic-meets-Bogart to a much more sophisticated, and interesting world, which is helped immensely by a wonderful reading. The characters are generally interesting with great back stories, though they are a bit cartoonish in their abilities and motives; though that suits the fast-paced plot. 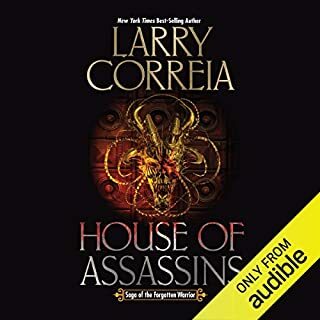 Correia is a gun nut, and obviously is into military history, and he puts his talents to work in the story, including one of the most epic (and well-described) fight scenes on Audible - though you should note the descriptions are often quite bloody. Overall, this entertaining, well plotted, and occasionally genuinely funny - a great "beach listen". And the reading is amazing. It can almost make you overlook the ugliest book cover in the universe.